We study the harmonization of the base pay for the Members of the European Parliament (MEPs). Prior to this reform, implemented in 2009, base pay was aligned with that of national parliamentarians, causing large differences in pay between the MEPs representing 27 member states. 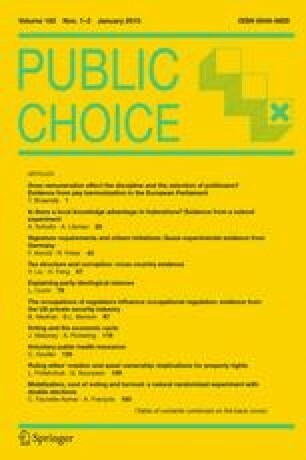 Based on detailed information on individual MEPs between 2004 and 2011, we find that the reform, which introduced an exceptional base pay increase of 200 % per national delegation on average, has a positive incentive effect on in-office effort proxied by the number of speeches, written declarations and reports drafted. However, more generous remuneration is associated with higher rates of absenteeism. With respect to political selection, we find that higher pay also raises reelection rates. The composition of the pool of MEPs in terms of (ex-ante) quality approximated by formal education, previous political experience in elected office and occupational background is, however, unaffected. If we restrict our attention to newly elected MEPs, a salary increase is related to fewer MEPs with previous political experience at the highest national level. I am grateful to the editor William F. Shughart II, three anonymous referees, Gabrielle Fack, Patricia Funk, Thorsten Henne, Krisztina Kis-Katos, Stephan Litschig, Ulrich Matter, Tommaso Nannicini, Reto Odermatt, Michaela Slotwinski, Alois Stutzer and participants at the UPF LPD Seminar, the BACT Seminar at Erasmus University Rotterdam, the SSES Meeting in Neuenburg, the FFA Brown Bag Seminar in Berne and the EPCS meeting in Cambridge for helpful comments. I also thank the Swiss National Science Foundation for financial support and the Department of Economics at Pompeu Fabra University, Barcelona for its hospitality. Special thanks go to Charlotte Ruetz and Laura Sochaczewski for excellent research assistance and to Barbara Schlaffer Bruchez and Hermione Miller Moser for copyediting.